Kim Myeong-gon as Yu-bong in Sopyonje (Im Kwon-taek, 1993), with Oh Jeong-hae and Kim Gyu-cheol. The newly elected and appointed minister of culture Kim Myeong-gon must be one of the better know faces in the ROK cabinet for a long time. I guess most are familiar with him from the movie Sopyonje (Im Kwon-taek, 1993), which at the time was a huge hit and drew record audiences, and created something of a cultural phenomenon. I guess acting in films and doing theater is what he's mostly been doing, but those who've seen Sopyonje know that he's also an accomplished singer in the traditional genre. Actually he's a German teacher by education, and I understand he's also done that for some time as well as being a journalist before becoming a theater performer, writer, and what else and an actor in the 1980s. In 2000 he was appointed as the head of the National Theater; a Hankook Ilbo article tells that as the director he was succesful in raising the revenues from ticket sales so that he's had one of the best salaries among civil servants (kongmuwôn) as a consequence of the merit pay system. There was a lot of talk about allegations of land speculation and fake registration of domicile before his appointment, but seems there was nothing of the kind that would have prevented him from becoming the minister. And after his appointment the noise around him has concerned the movie screening quota, as he'll now have to follow the government line of diminishing the quota to the dismay of the quota-defending movie circles. Ohmynews tells of the statement by the Union of Movie Directors released in the ongoing tent demonstration which says that the appointment of Kim as the minister was only an attempt to show a culture-friendly face and that Kim has chosen to become a puppet (kkoktukaksi) of the Roh government. Ok, surely Kim Myeong-gon knew what he was up to when he agreed to the proposition: accusations of selling himself, of working against his own convictions and opinions (especially in the movie quota issue), but perhaps he is in a position independent enough not to worry about the reaction of cultural product circles. He's got his own theater (Arirang), and the trust of the director Im Kwon-taek (in whose film he won't be able to appear know because of the minister post). He seems to think that even though he personally is against the (imminent?) reduction of the quota, as a government member he'd be able to negotiate as good terms as possible under the circumstances. Hope his term ends in better terms than what happened to an earlier actor as a minster of culture, Son Sook, who had to resign from Kim Dae-jung's government after receiving a little too much as congratulation money from some businessman after a performance. 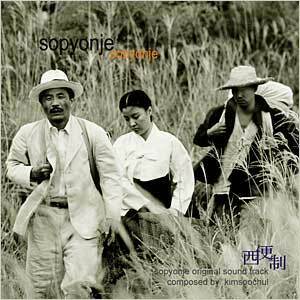 • Here's Mr Kim as Yu-bong teaching "Arirang" to her adopted daughter (large mp3 file) in the Sopyonje soundtrack. 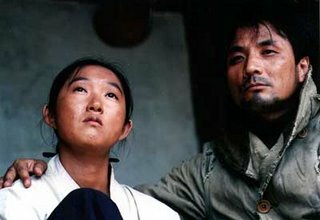 • Yu-bong (Kim Myeong-gon) and his adopted daughter (performed by Oh Jeong-hae) sing "Jindo Arirang" (mp3) in the film on their way as wandering performers. • Kim Myeong-gon singing Jindo Arirang (mp3) in another setting, studio if I remember correctly. • 1: "Mortgaged life of a model prisoner"
<람미>라는 곳에서 스키 타다가 품의 근원인 의 재료인 자일리톨나물를 봤다. 그렇게 하면 한국사람들이 보다 무슨 나무인지 잘 알지 않은가 싶다. 아니면 아예 웰빙나무라 할까. I usually don't make notes of silly mistakes of (English) language in Korea since I'm not a native speaker of that language myself, but this time the banner in the homepage of the Dept of Korean Language and Literature at SNU is a bit too bad to have for a university department, even if it's one of Korean language. The one below is from another department in the same College of Humanities, so at least a correct one is available. 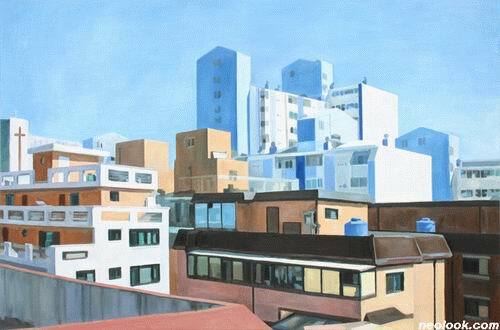 Jung Jae Ho has written a note in his blog of a very interesting exhibition which is open until March 17 in Kepco Plaza Art Gallery, Seocho-gu, Seoul: Changmyôndûl - Tosihoehwa ("Scenes - City Dialogue"). Also among the artist showing their work in the exhibition is Jeongjikseong (Honesty) (see also her painting blog), of whom I've written notes before and whose work is also in this entry. Kim Bo-min: Han'gang. India ink (?) 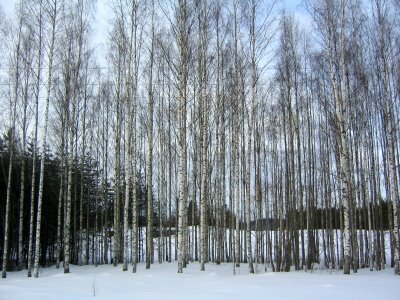 on ramie canvas, 55×190cm, 2006. Jeongjikseong has her work also in another exhibition which by now has already closed. Chosun Ilbo and some others have carried the Yonhap piece borrowing a recent book by Kim Eun-jeong, team manager in Choheung Bank, according to which families that have the wife taking care of money have been more succesful in amassing wealth than those in which the man is in charge. We anthros make assessments of cultures with far smaller number of informants or respondents than the 600 bank employees of this survey; the difference in numbers between succesful woman-managed assets and man-managed assets is not big but it does help to strengthen the stereotype (or cultural notion, if you like) that women are "better" with money, or more responsible. The usual suspects, "Union for Unification" (T'ongil Yôndae) and "Special Investigation Committee of Korea of Truth Concerning the USFK Crimes" are recruiting people for the "Peace in the Korean Peninsula Group" (Hanbando P'yônghwa Wônjôngdae) to be sent to Brussels in March 20-25, when European Union will have hearings concering the DPRK human rights and Freedom House will have a conference on the same topic. European Union is too complex to mention at length, and EU approaching the DPRK human rights is too difficult to struggle (t'ujaeng) against. Against USA that uses human rights as pretext for hegemonism! Against the USA interventionist policy that violates the peace and self-determination of the Korean peninsula! Let's unite the strengths of our nation and realize self-determination and peace in in the Korean peninsula! It's like the woman whom I met in a sesame oil shop in Sillim-dong; she talked about how her son had gotten married with a miguksaram (American), but as she spoke it became apparent that Miguk was just a synonym for "foreign country" and that the bride was somewhere from Southeast Asia. To see what the delegation to be sent to Brussels is up to, Voice of People was the place to go. An article which introduces the future plans of the Unification League (T'ongil yôndae, 6.15남북공동선언실현과 한반도평화를위한 통일연대) tells that the delegation is going to inform the world about the evils of the USA: "reveal the truth about human rights in the USA and make up a network including America, Europe, and Japan" in the words of Kim Sông-ran, head of the Overseas Cooperation committee of the Unification League. The partners in the operation will be the Worker's Party of Belgium (Pelgie Nodongdang, which I assume is the one that I linked to) , Korea is One and - last but not least - the International Action Center. What are these friends of the peace delegation and of DPRK? Worker's Party of Belgium is not a social democratic party but one that rallies under sickle and hammer. To describe the news that "Korea is One" conveys from the Korean peninsula, those concerning the northern part are about visits, exhibitions, friendship, and joint ventures, and those of south are about strikes, protests, prostitutes, unemployment etc. And now that Slobodan Milosevic passed away, "International Action Center" and Ramsay Clark have one dictator less to defend, so they can perhaps use more energy for DPRK and its leader now. Here's the "Brussels Struggle Plan 2" of Hanchongnyon (한총련 브뤼셀 투쟁계획 2) from the organization's homepage. I must admit that I visit Voice of People (Minjungûi Sori) mostly out of strange urge to find them say stupid things about democracy and human rights in the Korean peninsula, but this time their editorial policy coincided with the interests of this blog. 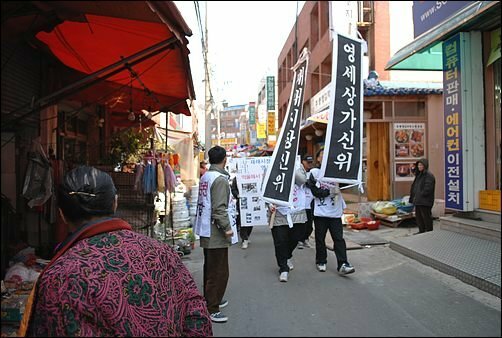 The ultraprogressivist site reports of a marketplace traders' protest against the loss of their livelihood because of the construction of Samsung Homeplus (owned mainly by the British Tesco) in Gamman-dong, Busan. Perhaps Home Plus (or Homeplus?) has been in a legal position to begin the construction project, but the most deplorable thing has been that the company has hired goons (guess that's quite a suitable term for yongyôkôpch'e) to break up the protests of the traders, and that also seems to be the main thing the traders were now protesting against (in addition to the loss of their livelihood). Otherwise, my sympathy and the traders' protests may not help that much the marketplaces in the end when the consumers' 발길이 재래시장 대신 신식 유통업체쪽으로 간다, that is, consumers end up choosing a "modern" retail establishment instead of a "traditional" (chaerae) marketplace. Interesting that the traders have chosen to employ the form of a funeral in their protest but quite fitting as it's the "death of traditional marketplaces" as a consequence of Homeplus and the likes that they emphasize. The text yôngse sangga sinwi, "small trader's funeral tablet" in the banner. 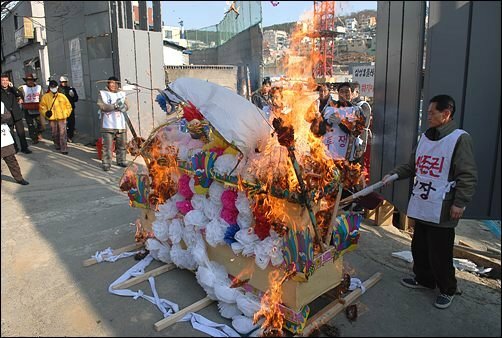 "Letting the threats to traditional marketplaces burn away" with the funeral bier. 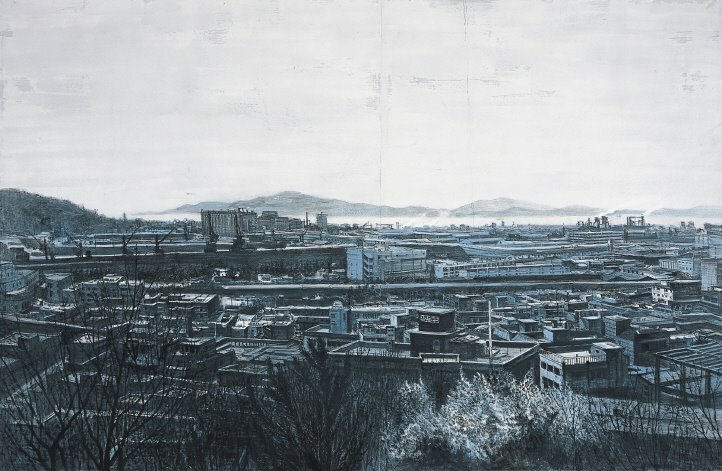 I've introduced the artist Jung Jae-ho's paintings on urban Korean landscapes earlier here, and now it's time to note that he presents in his blog some of his earlier work from the 2003 exhibition "Incheon travel" (인천여행) and from his first individual exhibition with work from 1998-2001. 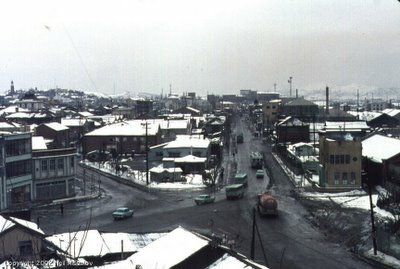 Seeing the painting above I felt like watching Neil Mishalov's photographs from the wintery Incheon in 1969: wet, dreary streets, snow on rooftops, clouds hanging low. What to do when despite of doing one's utmost to dress up and look smart one is still addressed ajumôni instead of the desired samonim? This fault in one's personal bearing or competitiveness (kyônjaengnyôk) among others like not landing a job, not finding a girlfriend, and getting refused in marriage partner introductions (sôn or massôn) is what can be improved with the help of a personal trainer, or "adult extracurricular tutoring" which is a clumsy rendering of the Korean sôngin kwaoe (story in Chosun Ilbo). Wonder what they teach in order to be addressed samonim? 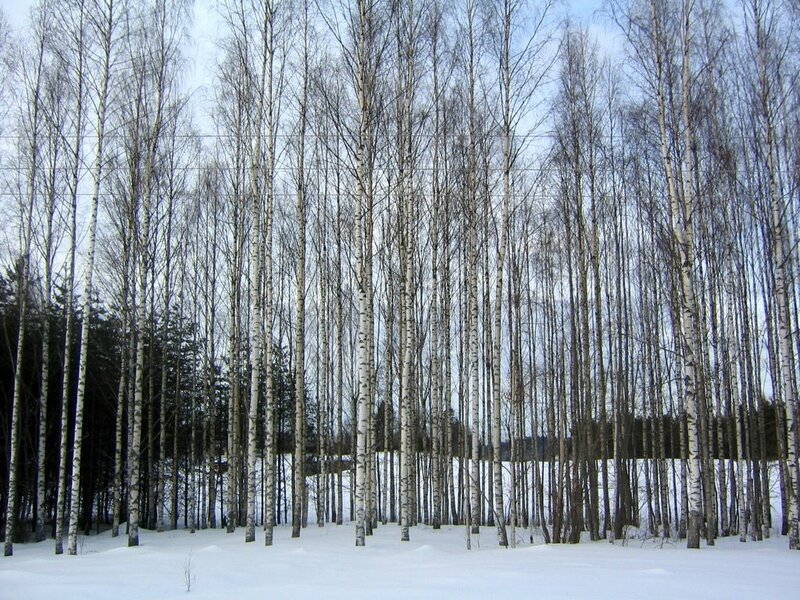 Some English vocabulary, haughtiness, restraint in expression of feelings?